Amboyna begins with the interrogation of Shichizō, a 24-year-old mercenary from Hirado. Despite their importance, we know very little about the eleven Japanese soldiers interrogated at Amboyna. Part of the problem is that they penned no document of their own and we have to rely on scattered clues in the judicial records. We do know their names, their hometowns and their ages. They were young. Their average age was 31, with individual ages ranging from 23 (Sidney Migiell) to Sacoube, age 40, and Thome Corea, 50. Given the fact that Japan had been largely at peace since 1600, it is unlikely that most or any of them were the hardened samurai that the Company imagined and it is more likely that they were drawn from maritime communities. The majority were from Kyushu, the traditional maritime hub of the archipelago: five were born in Hirado, three in Nagasaki and three originated in other parts of Kyushu: Hizen, Karatsu and Chikugo. In the sixteenth century, this part of Kyushu had been a major hub for Japanese piracy and it is possible that the Company drew its recruits from marginal communities that had previously supplied military labor to pirate fleets. We don't have the original signatures but rather a copy made by a Dutch scribe in the immediate aftermath of the incident. Although decipherable, it is clear that the Dutch scribe struggled to reproduce the complex Chinese characters for 七蔵 (Shichizo). 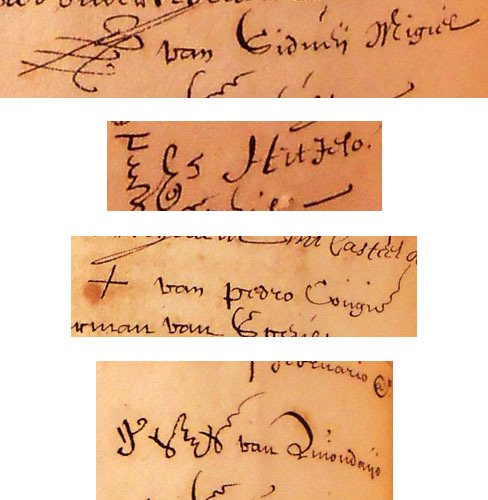 The scribe was clearly far more comfortable with Sidney Miguel’s signature, a sweeping, self-confident, Europeanized scrawl that looks similar to the extravagant signatures used by VOC officials. These signatures are interesting because they show the very different backgrounds of some of these soldiers. Miguel's is perhaps the most interesting as it seems to show an individual capable of straddling multiple worlds, but like so many brokers and middlemen in history, he may have found himself an object of suspicion for precisely this reason.